The weather forecasters say it’s going to be triple digits in Los Angeles this weekend. It’s fall for goodness sake. While it appears global warming has us in its clutches, whenever the temperature does decide to drop, Princess Piggy Poo is prepared. My cute cavy will be warm and toasty in her cozy new throw crocheted by the Queen Mum. Princess Piggy Poo can’t wait for a chill. She loves to burrow under covers. 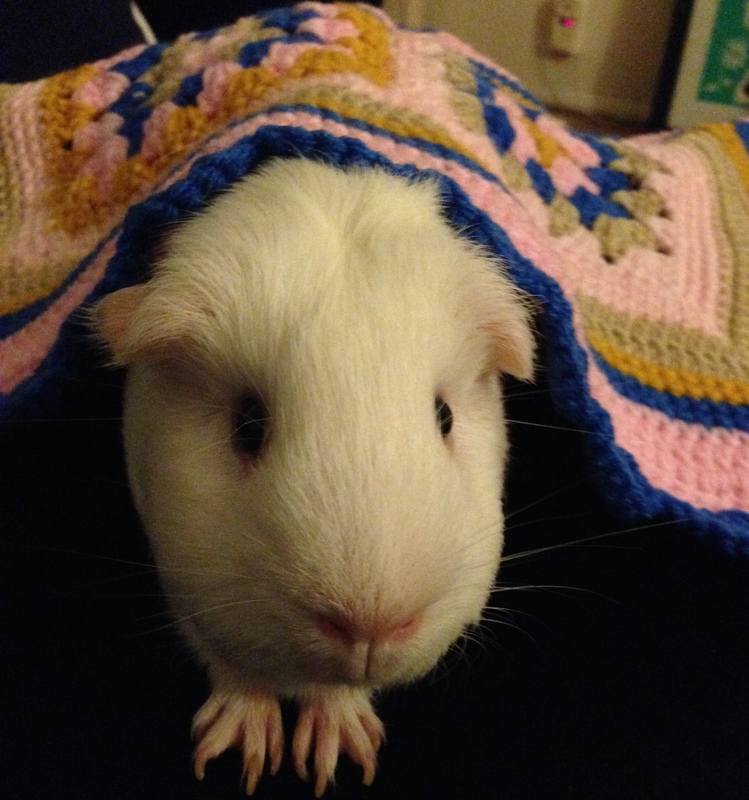 The weight of the blanket makes her feel secure — a feeling that’s hard to come by for a guinea pig. Her new throw is a one-of-a-kind that was lovingly created exclusively for Princess Piggy Poo. This makes it worthy of a royal. Now with her new blanket, winter is Princess Piggy Poo’s favorite season. Even though winter makes it feel cold outside, Princess Piggy Poo will be surrounded by warmth and love inside her majestic covering. This entry was posted in Guinea pig housing and tagged blanket, cavy, crocheted, guinea pig, Los Angeles, princess piggy poo. Bookmark the permalink. Princess Piggy Poo’s idea of winter is anything cooler than 70° F (21° C). She is spoiled living in Southern California. She doesn’t wish Jack Frost to visit you any time soon.